But really, this client was a dream to work with. She trusted me but expressed when she was nervous or skeptical, and we made a great team. Even when the painter was making fun of the wall color, my client stayed strong and trusted (or at least pretended to) that when it was all put together she would love it. Now they are thrilled and I can't wait to have Tracy take professional photos of the dining and living room. But for today, I'm just sharing the smallest preview. There's more to love here that I can't share yet. Here's how their dining room looked when I first visited the home. are very stylish and professional, and deserved a space where they could entertain their family and friends with confidence. What they had was fine, but not wonderful, because it didn't reflect their style. She seemed much more swanky and fabulous than her house let on. I was able to find these chairs on Craig's List for a steal. I knew the moment I saw them that they were perfect for the room. Julie from Simple Redesign (who is ridiculously good at what she does, you must check her out if you live anywhere close to West Michigan) lacquered all the chairs in a high gloss white, making them much more modern and fresh. I can't tell you how good they look! Julie is a real pro. Then my upholsterer added faux ostrich vinyl to the seats. I'm not above practical, but let's keep it stylish, people. The whole room, even the moldings, was painted Lead Gray. We kept natural wood in the mirror and table top for warmth, and a light fixture that just glows at night. The white silk drapes add another texture, but it's difficult to tell in the photo. Big thanks to my client for taking this photo! plenty of parties if this was my house. I can't wait to share the rest with you! Just know that good things are happening behind the scenes. It is insanely good and I am only seeing a peek!! oh well done you, this is gorg! i am DYING over this! seriously. my fave! That chandelier! Yum!! And the mirror! And wall color! Can't wait to see the rest. This is crazy.gorgeous. Like magazine gorgeous. You big tease. I want to see more! The light fixture has me intrigued. Love it - Can't wait to see more! Whoa. One of the amazing transformations I have ever seen so far! 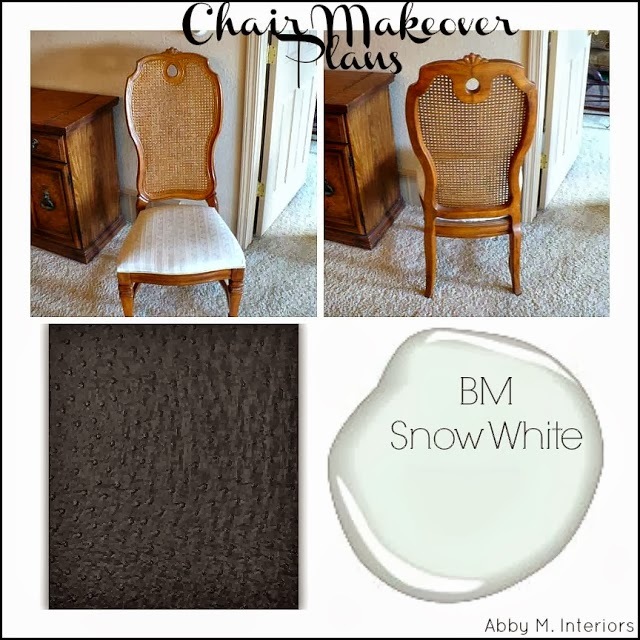 I can see that the light fixture changes into white which is fit perfectly in the chair. How about the mirror? Absolutely attractive. Classy! I'm dying over that dark wall!!!! In true 'Abby style', that chandy looks amazing (as does the entire room)! Can't wait to see more. NEED the scoop on the chandy!! Fabulous!!!!! !